Each year, 181 species of waterfowl, shorebirds and riparian birds flock to California’s Central Valley to nest between March and July November and March. The space they roost in is already limited: There are just 19 wetlands, comprised of National Wildlife Refuges and State Wildlife Areas, spread across little more than 270 square miles in the valley’s 22,500-square-mile expanse. But over the past five years during the state’s historic drought, those birds have returned, only to find once watery areas no longer suitable for nesting. If dry conditions persist, the little remaining space could disappear. 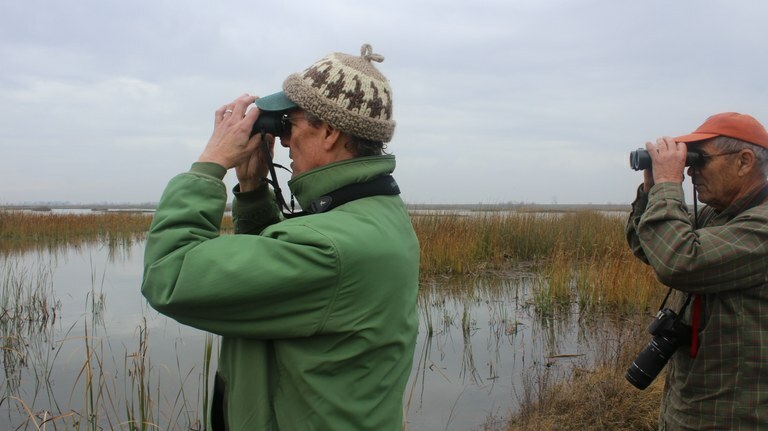 California scientists monitoring wetlands in the Central Valley over the past two years have documented a cascade of effects from the drought: Wetland areas are shrinking, which leads to plummeting bird populations and the spread of disease. And the drought is handicapping the few solutions that conservationists have. Promised water allocations to protect wildlife during drought haven’t arrived, and rice farmers who offer surrogate habitats in their drenched fields are switching to crops more suitable to a drier environment. In the last century, California wetlands have decreased by 90 percent. Over the past two years, six California Audubon chapters along with the Central Valley Joint Venture, a consortium of representatives from the U.S. Fish & Wildlife Service, Ducks Unlimited and other conservation groups, have been surveying eight wetland sites in the Central Valley to document the short-term effects of the drought on bird species. Volunteers from Audubon California venture into the field twice a month, November through March, to record birds and nesting sites. They have documented serious threats to the remaining sliver of habitat that shorebirds, ducks and migrating birds depend on. The Cosumnes River Preserve is one of the few protected wetland habitat areas in the state. In the Central Valley, the preserve is a critical stop on the Pacific Flyway for migrating and wintering waterfowl. As wetlands continue to shrink, bird populations are impacted in two ways. The first response is reduced breeding. During the drought monitoring field trips, the observers counted the number of nesting sites in areas that water birds typically use. Formerly an abundant species in the riparian woodlands of California's Central Valley, the least Bell’s vireo, a small silver-grey bird particularly sensitive to human activities, has been in a long decline. The culprit is water diversion to accommodate sprawling development in its habitat range, according to the National Wildlife Federation. Last year, the vireo actually stopped breeding entirely in some areas because the drought desiccated nesting areas, Hertel says. Several other declining bird species have become further stressed. In just the past two years, the number of sites where California mallards, the state’s most common duck species, nesting has dropped by 46 percent, Hertel says, and the marbled murrelet has been making fewer appearances in the Central Valley. The second response is more immediately fatal. As shorebirds and waterfowl rest, nest and eat, even the shrunken populations of bird species are crammed into tighter spaces and diseases, like the bacterial infection avian cholera, have proliferated and killed thousands of birds. Last year, only 1,000 birds died from diseases connected to the drought in the Central Valley. Big rains in December and February replenished some of the habitat that had been drying up – and allowed birds to spread out, diminishing chances for them to spread illness. All things considered, the area was lucky; the drought could have lead to a far larger die-off. “We were very concerned about disease outbreaks. Some state agencies had response teams ready,” Hertel says. “But a big rain in December doubled the amount of habitat on the ground. We dodged a really big bullet.” In 2013, at the height of the drought, 9,000 ducks succumbed to avian botulism at Tule Lake National Wildlife Refuge in the Klamath Basin, north of the Central Valley. Even the solutions that conservationists have relied upon in the past are beginning to unravel under drier conditions. In the early 1990s, conservationists began teaming up with farmers to increase wetland habitat for migrating shorebirds and cranes by trying to find multiple purposes for allocations from the state’s increasingly scarce water supply. The result was the creation of an unlikely surrogate habitat: rice plantations. Conservationists worked with farmers who had existing rice plantations to make them more bird-friendly by adding nesting sites in the marshy fields. In some places, farmers planted rice in dry areas and flooded the ground with a few inches of water. Once that happened, birds couldn’t distinguish the difference and began using the rice farms as respites and nesting sites. Rice is grown in heavy clay and standing water that not only exists as a man-made wetland, but also benefits both birds and farmers, Hertel says. While birds use rice plantations as nesting and breeding sites, they eat the leftover grain that grows from the rice, which farmers previously had to burn to prepare their fields for next year’s crop. In the last five years, though, farmers have been getting less water, and many have switched to less thirsty crops. “I can’t blame them,” Hertel says. “Everyone in California has had to cut back.” The water for existing wetland refuges, too, has gone down by 25 percent due to reduced allocations and insufficient precipitation in the valley. Volunteers count nesting sites during a November 2015 drought monitoring trip. In the over-allocated Central Valley, even water promised by law doesn’t guarantee enough to keep wetlands wet. The Central Valley Project Improvement Act, passed by Congress in 1992, promised 800,000 acre-feet of water for restoring wetlands and fish populations across the state. As High Country News reported in 1995, for the first time, the law put nature into the equation of California water use. But it hasn’t worked out that way in practice. "Even in a good year, the refuges have never received their full allotment of water," about 550,000 acre-feet, Hertel says. Note: This article originally stated that the 90 percent wetlands loss came from research conducted by Audubon California and the Central Valley Joint Venture. In fact, that research was originally conducted by the California State University, Chico for the U.S. Fish and Wildlife Service and the U.S. Bureau of Reclamation.